What would you recommend to build an excellent home studio? What have you learned over the years that no one told you when you started your voiceover career? What kind of skills or attributes should one have to be an excellent professional? What advice can you give to send great auditions and demos to potential clients? How do you promote your work and your personal brand in the digital age? What strategies do you use to set fair rates and get paid on time? What would you recommend when thinking like a business (you are your own career manager)? How do you handle your accounting records? Please demystify voice casting sites! What do you think about agents, marketplaces, casting directors, unions, and/or production houses? How do you kickstart a project after you have been hired? What is your policy on re-takes, or what do you recommend? We hope they serve you as keys to success….to your success. Russ Roberts: The first and most important thing you need is a space where there is no noise. Preferably a room that has been acoustically treated, that you can call your studio. A quiet room (or enclosure) is THE MOST IMPORTANT THING! I cannot stress this enough. You can have the best voice and best equipment in the world if there is background noise or terrible sounds coming from your recording station it will all be for nothing. Second would be your choice of microphone. A Large Diaphragm Condenser Microphone is optimal for voice recording but will require 48volts of phantom power to operate. Third would be your Audio interface. You need a good audio interface to turn your analog signal (sound from your mic) into a digital signal (for your computer). In doing this you should opt for an interface that has phantom power to operate your microphone. Last would be your editing software. Many options are available, such as Adobe Audition, Audacity, or Pro Tools. You can generally download a trial of these programs to learn the ropes and see which one suits you! There are many other things that you could use to tweak your studio and add to your DAW, such as amps, signal processors, or plugins. But keep your studio basic when starting out. You can always add more as you grow. Charlie Hackett: Professional guidance! Call somebody in the business or watch YouTube videos, but learn all you can BEFORE spending a penny. That way, you’ll have a studio that works for YOU, your voice, goals, and budget; not somebody else’s. Elle Sommerling: It may be tempting to go for the cheapest acoustic treatment options but the difference will always be noticeable. Invest in real acoustic foam to hang around a room, in a booth, or even in a cardboard box. You won’t regret it. Claire Ottewell: Since chances are you’re going to be there a lot, make it comfortable and functional. A comfortable and ergonomic desk and chair will ensure you’re looking after your body and allowing your voice to be at it’s best. Plus you’re likely to be sitting in the same place for a long time so you need to make sure your mic isn’t picking up sounds of your moving about in discomfort. Helen Moore-Gillon: Your voice is a small part of the equation – learning how to run a business is key. Hugh McClellan: You have a niche. It may not be what you thought it was. Audition for a variety of different jobs. A theme (or vocal style) may show itself. Hone that style! Roman Kollmer: The business is getting faster and faster, be prepared for a max. 24h turnaround. Manage your time effectively. Armando Talavera: It is all about customer service. Make sure you understand your client, as well as the client of your client! Remember that there are many people with a similar voice to yours; customer service can make the difference in the long term. Colin McLean:Respect and manage the client’s expectations. Always. Russ Roberts: You need to be a positive person. Educate yourself. Not just in learning HOW to be a voice talent, learn HOW to be a business person. This is a business, treat it as such. So you have learned how to record and edit and speak into a mic, what is your marketing plan? How do you get your name out there? I have heard terrible voiceovers and talents who made it because they were great people and excellent at marketing themselves. Learn your craft, put a business plan together and go for it! Adam McLaughlin: A friendly, easygoing attitude is essential. In the age of digital auditions where the potential client seldom sees your face or even hears your voice outside of the audition, anything you can do to create a positive personal connection can work wonders in terms of getting that one gig or securing repeat customers. Jennifer Tophoney: Customer service is the single most important skill after your voice. Treat every client with courtesy. Be professional. Follow through on your commitments to time, quality and format. Joseph Grimm: Be able to take criticism with a smile and a positive attitude. Continuing education in the voiceover field is a must. Things change at such a rapid pace that everyone can learn something new just about every day, so keep informed and up to date on all the latest technology to stay competitive. Amy Farris: Have fun and play. Do something different to stand out. Often the client doesn’t know what they’re looking for. Make them sit up and take notice. Melanie Granfors: Don’t treat it as an audition. Treat it as if you are delivering the final product. Ethan Gabriel: Don’t be lazy! DE-BREATH…makes you sound like the pro you are. Take the time to listen to your audition….if you hate it, redo it! Dan Taraborrelli: Have a website, maintain a presence on leading social media sites, make updates, stay current and relevant. Kim Somers: You need your own personal website. Having your own domain is very inexpensive. Take some time and create a great website with demos and contact information. Also, Facebook and Twitter are important. Update often. Ryan Laughton: Social media is obviously a fantastic way to promote your work. Make a Facebook page, Twitter page, Soundcloud account; the list goes on! These are great ways to market yourself and they all link to one another very easily. However, sometimes it’s great to think a little more outside the box. For example, don’t be afraid to scour the internet for video game developers and directly send them your character voice reel. You never know who may contact you – and besides, what have you got to lose? Anders Sundberg: Always state on your invoice when you expect payment. Follow up 3 days after that. I follow my gut when it comes to rates. Don’t undersell yourself. You are unique. Sean Ruttledge: Don’t take work that pays less than you’re worth, and don’t be afraid to ask for your money. Christopher Roman: With someone you do not know, get half payment up front. Then build on that. Once the relationship is established and both are happy, you can always change your terms. Rates? Follow the industry. Jay Smack: There are industry standards, and you should adhere to those norms. Do some research and figure out what you should be charging for radio vs. TV and consider market size and length of the cycle. Get all that information up front. It’s not unprofessional to know where your “product” will be used. They’re getting paid for using you, you should be paid accordingly for your time and talent. Also, you could offer estimates for your work. If it’s a long narrative piece, give them a break on volume. But build in plans and rates for revisions. As far as getting paid on time: submit your invoice, follow-up in a friendly manner if it’s not paid on time, follow-up again, and prepare to elevate matters if necessary. If you involve an attorney while trying to collect on outstanding invoices, make sure the amount you’ll recover is worth your time and the burned bridges that may result. You have to get paid, but the sad reality is that sometimes, jerks will get their way and slither away from their responsibilities. Sheldon Roberts: When you’re working with a client for the first time, I would suggest 50% of the budget paid upfront with the remainder on completion. Matt Wiewel: Check the Global Voice Acting Academy Rate Guide and SAG-AFTRA scale. Invoice immediately after the project is complete. Clearly state on your invoice that there is a finance charge after 30 days. Follow up politely if they are unpaid after 30 days and be persistent. Armando Talavera: Voice 123 offers help with this, read this article. If you don’t have an established career, you can be open to negotiation, just make sure you don’t go too low, because that affects everyone in the industry, including your future possibilities. Joseph Grimm: I am constantly searching other VO talent websites and rate sheets and the rate sheets from professional studios and the unions to make sure my rate sheet is up to date and still competitive with others in our field. I use a professional website to send out my invoices so they look as professional as the audio I record. I do recommend setting up a partial payment from the client before beginning a project with the balance due when the project is completed and approved. Paul Cuthbert: Be professional, create a business name, register the company with your state and local government and open a separate bank account for the business. You can track expenses better and purchase equipment through the business bank account making it easier at tax time. Plus it’s really cool to hand out business cards or have a check card with an official logo and company name that you own on them. Philippe Duquenoy: Work out how much you need as an annual income. Then keep statistics. You will eventually be able to calculate how many auditions you need to do to earn the required income. Russ Roberts: Ask yourself the common question: Where do I wanna be in 5 years, what is my plan? If you are in it for the long haul, you have to put a plan together. Strategy, how many hours a day do I audition, how many hours a day do I hone my craft, how many hours a day do I market my brand. Your business depends on you! Run your brand like you are going to be successful, not lucky. Hard work pays off. We all need breaks, but luck, generally, is made not found! Jay Smack: Deliver what you say you will when you say you will. And honor commitments. This all falls under the heading “Service”. Ours is a service industry. If you have a gig booked and another, better-paying job comes along, honor the gig you booked first. Otherwise your brand could suffer. If not being available, or backing out of projects you’ve been hired for becomes a pattern, word will get around. It might take a while, but some of the best voice talents have lost work because eventually no one wanted to work with them. Be a good vendor, and if hiring or subcontracting, be a good client. Charlie Hackett: You are (or should be) a business person and what you do IS valuable! Don’t sell yourself short and be confident in why you charge what you do. Communicate ALL expectations, (yours AND the client’s) financial and otherwise, upfront. A rate sheet with full disclosure of what you charge for what, exactly when payment is due, and “if/then language” is good business and means no surprises for you or the client. John Leary: I believe that self-motivation and time management are the two essential skills that many freelancers lack, so be mindful of structuring your workday to maximize your efficiency and minimize non-productive activity. Simeon Lloyd: Always be professional, polite and as efficient as possible. I have built long lasting relationships with clients based on the fact that when they ask for an audition from me, they know that it’ll be delivered on time and to the best of my ability. Jim Price: Time management is still important in this business. Dedicate a certain number of hours to auditions, to marketing, to learning your craft. Commit to continuing education via webinars, books, training, etc. Never stop improving. Andrew Racho: Put in the hours, invest in your product, upgrade your tech over time, keep your product quality high, market like a mad person, and learn from the successful people. William Bradford: Quickbooks. Finance Friday. I update invoices and expenses every Friday. Amy Farris: Wave Accounting (https://www.waveapps.com/). It’s free (ad supported) and does everything I need it to. Jay Smack: If you’re lucky enough to be very successful, perhaps you can hire someone to handle your books. But it’s more likely that you’ll have to do it yourself. Set up 2 bank accounts: one for workable capital – the one from which you can use and spend income, and another for taxes and the unexpected. Use a program like Quickbooks, or even Microsoft Excel or something similar. Track every dollar in and out if you can. Keep receipts. Write down expenses. If you’re working for yourself, all of this is tax-deductible. You’ll probably really need the write-off, and if you’re writing it off, the government might want to know how and why one day. Make sure you have the trail to show them or it becomes a nightmare. And get a tax attorney or accountant. They’ll keep you straight. Sharon Huff Robinson: I try not to rely on my memory too much – I keep logs for long projects, and try to get invoices out right away. I have a spreadsheet that contains all my billing info, and another with client info. I bold unpaid invoices, and unbold them as soon as the check comes in – makes it easy to see who I have to nag. I don’t record expenses – I just throw them into either a physical or virtual box until the end of the fiscal year. I never delete an e-mail stream until every last detail of a project is wrapped up – including copies of projects and inputting client info. If my e-mail gets out of control I move them into a follow up folder. Jared Hernandez:PayPal has a nice invoice section where you can keep track of billing and such. I personally also use a formatted Excel sheet, though you could also use something like Quicken. The important thing is to find some form of record-keeping that works for you. If you’re not organized, get there or find someone to help! Otherwise, you’ll be hurting come April. Stephen Pace: If you’re brand new, you can still find work. Kim Somers: You have the opportunity to audition for a lot of different types of projects and if you get the job, you don’t pay a percentage to an agent. Sharon Huff Robinson: The benefit of a casting site is that you control your audition process – the more you know about your strengths, the better you can design your profile or sell yourself to a possible client. The downside is that the labor market is huge and you have no one promoting you or singling you out. So first get some great demos. Second, research the site, and see who is getting work and how they get it. Third, once you sign up, identify how you’re going to work the system of that site in a way that works for you. Then, as you start doing demos and hopefully get some feedback, repeat steps 1,2 and 3, hopefully dialing down on what works and pays off for you. 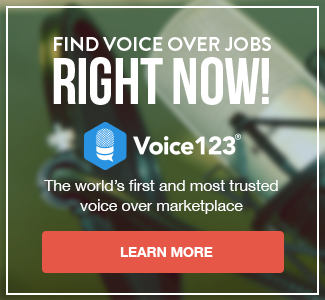 On an anecdotal level, when I first signed up for voice123, it took me almost a year before I did steps 2 and 3, but it paid off almost immediately once I did. Part of that is because Voice123’s system works well for me. Dawn Bird: It’s untrue that you will never get hired. If you are honestly devoted to your craft and you are practicing daily and auditioning 6 to 12 times a day…You WILL eventually get hired. But like all things, you must work hard for what you want in life. Russ Roberts: Online casting sites are very relevant in this industry. Some talents do not hold them in regard, others swear by them. Your goal should be putting your voice and brand in front of as many people as you can possibly be in front of. Voice casting sites are a growing opportunity, and while there may be different views, they provide a great way to get your name in front of people. Many sites also offer great tools and tips. They offer you auditions and the ability to get in front of the right people. This will help you hone your craft and help you get the feedback you may need. Online casting sites can be a powerful tool in your arsenal if used and managed correctly. Jordan Jones: Sure, there are many ways to land work – an agent(s), contacting agencies, marketing your website. But voice casting sites make it super easy to cover a ton of ground fast. They shouldn’t be your only means, but they should definitely make up a huge part of it. Shannon Scott: You have to work hard to get paid. Just because you sign up doesn’t mean you will book work. Kevin Cronin: They are simply one tool in building your VO career. They can be a big part of your career at the beginning – but they should only ultimately be a part as you grow. Paul Hernandez: There is a lot of competition, but if you strive to work hard at your craft, get coaching, use quality equipment, and give each audition your all, you will land jobs. Brian McKeever: While some may feel like they’re a scam or unfair to have a “pay-to-play” system, my experience has been that there’s money to be made if you have talent and capability, but you will definitely need to persevere. A majority of the complaints that I’ve heard come from people who I don’t believe have auditioned enough or jumped into a career for which they’re not properly prepared. Olivia Welch: The business is tough to crack. Work with people you trust and connect. Do not take work you find demoralizing or do not stand by. Amy Farris: Agents are a great source of high-quality jobs but aren’t a panacea for your career. You need to be on multiple marketplaces and rosters to get opportunities from many sources. Combine that with direct marketing and you’ll get a good business going. Paul Cuthbert: An agent can open doors that you might not be able to access on your own. I have spoken with production houses and given them demos and while some are approachable and open to listening to my demo other have said they only hire through a talent agency. Helen Moore-Gillon: There is a time and a place for everyone – make sure you cast your net as wide as possible… and particularly outside your own country – there is a whole world out there! Ashlyn Kindberg: Agents are great but they aren’t magical fairies that are going to drop VO jobs in your lap. YOU are in charge of how much you book. Russ Roberts: Put yourself in the ears of the decision makers. As a talent, you want to make sure you are getting heard and you are getting the chance to compete. You will not get every job, but then again, you should not lose every job. Networking for any business is crucial. The more your brand grows, the more your tools need to grow. And while you may not use that tool every day, you may need it in your arsenal from time to time. Agents, marketplaces, casting directors, production houses, all are tools to help you grow. As you grow you will value each differently. Some may choose to go in different directions, but as a business, I am a firm believer in never limiting myself to one area or another. Staying diverse, and keeping options will keep you growing and help you be successful. Ryan Laughton: I think these are all fantastic sources of work, however, you need to be sure that the particular source you use is the most beneficial option for your voiceover career. For example, if you are contacted by an agent and asked to join their books don’t jump into their arms at the first opportunity. Be sure to read through their website, do your research and be sure that they are going to help you to excel within your specific field before signing any contract. Sheldon Roberts: A successful voiceover career, or any career for that matter, isn’t just YOU being a “lone wolf” out in the wilderness. You need a team, and you need resources where to find work. Agents, marketplaces, unions, they are all elements that fit into what makes a successful voiceover career. Matt Wiewel: Agents can be great. Research them carefully and get with the best ones in each market. Marketplaces can be great if worked properly. You probably won’t make a full-time living on just marketplaces though. Casting Directors can be touchy. Some don’t like direct contact with talent outside of a particular casting. Some production houses keep their own rosters. Try to get on them. Jack Florian: I think they’re valuable, but they do need to adapt to a more modern age. Connie Waranius: My relationship with voice over is too important to trust a middleman. Head straight to Voice123. Read their posts. Sign up for 1 year free to check out scripts. Sign up become a member and audition. Dan Taraborrelli: Send a “welcome” email asking about key items – tone/pace/style, delivery, timing, pronunciations, due date, and go over the payment details. Rory Morris: This depends on the project, but first and foremost you must relax and breathe, calm your mind and focus, then make sure your studio is set up before you even begin to read copy. Be sure your mic and audio tech equipment and software are working through sound check…Make sure you have plenty of water and your mind is right for whatever project you’re about to start. Commercial copy can be very straightforward types of reads i.e. : Announcer…Corporate…Blue collar..there is usually a particular voice they are looking for.. So once I have the voice they want in mind for the commercial project it’s important to focus on that style and make a straightforward read using that particular style. If the client wants the read a different way, trust me, they will ask… Character reads on the other hand (for animation and video games) require you to dive deeper into becoming a hero or villain and anything in between. With my character work I will always use my body language to bring the character out of me. For example: if you’re asked to play a rat-like creature for a video game, kickstart the whole project by literally curling your lip and looking and acting like a rat. With any type of narration read you must be able to either explain a particular task or duty in a way that captures the attention of the listener or you must be able to capture your listener’s attention through your ability to tell a good story. If I have an explainer narration, I will stand up and act like a teacher first so I can hear myself explaining and tweak it from there as needed. With storytelling narration, I’ll pretend (at first) that I’m opening an old, magical book so I get into the storytelling mode. All of these are ways to think when starting off any new project. Russ Roberts: First off, smile! You are the voice someone has chosen for their project, and chances are you were one of many who tried out for it! Be excited, validation is the best confidence booster you can get. See, you can do it!! They like you, they really like you!! Once you settle in, make sure you get clear direction from the director or agent on what style they are looking for, what type of sound, and where they want the part to go. Just like any good actor, you need to get a feel for the part! Be professional and deliver what they are looking for. Jordan Jones: Study the script. Practice it. The better you know it, the smoother the session, the more believable you sound and the fewer edits you’ll need. Know your scripts! Jared Hernandez: I start by communicating with the director of the project to find out specifically what they are looking for and then I record the script as soon as possible. If there is a deadline, this leaves time for re-recording as per their direction. I make sure to eliminate distractions (e.g. put my phone on silent) and start off well-hydrated and energized/rested. Olivia Welch: I will do one retake free of charge, and make it clear before beginning that anything more than one retake is extra. Kim Somers: I record retakes for free if they are my mistakes. Script changes are extra. Gale Van Cott: All re-takes for interpretation are free, if the script has a minor change, you may include it if you want to build goodwill. Generally, re-takes for script changes are charged at a reduced rate. Apostolis Papageorgiou: When a pro voice over talent is asked for a re-take, he/she must get paid. Fair is fair. Jay Smack: I’ve been on both sides of that scenario. When you’re booking the talent, you need a certain degree of flexibility and understanding from them. When you’re the talent, you need to be able to give the client what they want and need, but you still have to look out for yourself. Jordan Jones: Depending on the size of the project, 1-2 retakes are commonly expected. After that, it’s common to expect an additional 20-50% added unless it’s the actor’s fault. Mike Wade: I recommend doing whatever makes them happy. They won’t pay you till they are. If nothing was said upfront about it, you could always ask. But even if the re-takes are because they wrote a whole new script, I won’t jeopardize tomorrow’s dollars by drawing a line in the sand today. A good relationship with repeat business will serve your future needs much better. Drevla Trainor: It’s on a case-by-case basis. Basically, if it is an error on my part, I will absolutely re-record at no extra cost. If it is on the client side, it depends how many changes are needed/how long it will take to re-record, and whether it can be recorded from a home studio or if travel is required to get to a specific location.